The northern black forest is a region of contrasts. Glamourous spa towns, ancient monasteries, forests and tiny towns where you think time stands still. Beautiful nature, clean air and healthy mineral spas invite visitors to get away from the daily stress and relax in the northern black forest. In the 1950s and 60s, when many Germans couldn't afford to go on holidays, we kids were sent for recreation to the black forest. I loved it, and I have returned many times to the beautiful region since then. The Nordschwarzwald boasts several gourmet restaurants, rewarded with three and two stars by the Guide Michelin. Whether you dine in a star-decorated restaurant or a simple Gasthaus, the local cuisine is excellent everywhere in the black forest and always worth the journey. Themed holiday routes like the Schwarzwaldhochstraße, (black forest ridge road), Schwarzwaldtälerstraße (black forest valley road) and Schwarzwald-Bäderstraße (black forest spa road) criss-cross the area. They are well signposted and easy to follow. 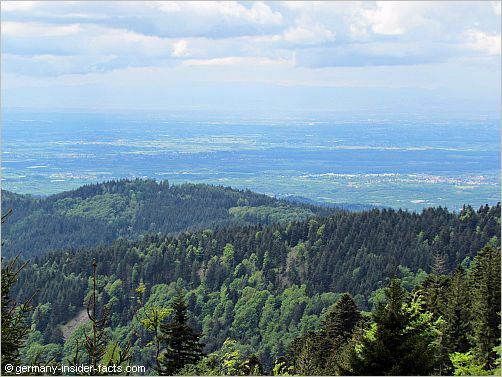 It is a beautiful drive along the black forest ridge road from Baden Baden to Freudenstadt. This is the oldest themed road, and probably the most beautiful, im Schwarzwald. The winding road climbs to an elevation of 800m to 1000m and offers great views to the Rhine Valley. There are hardly towns of any size along the 60km drive. Bühlerhöhe - The historic Schosshotel Bühlerhöhe is located on a spur with fantastic views. The luxury hotel is closed for thorough renovation from 2010 until the end of 2012. It should be reopened in 2013 for the 100th birthday celebrations of the historic house. Nearby is the private Max Grundig Klinik that offers wellness, prevention and treatment of several medical conditions. Hornisgrinde (1184m) is the highest mountain in the northern black forest. There is a lookout tower on top to enjoy stunning views. Discover the unique moor landscape on a walk on the boardwalk. Mummelsee (1038m) is a legendary cirque lake on the southwestern slope of the Hornisgrinde. Lovely mermaids and nymphs are said to live in the lake, and there are many stories around of locals who met the ghostly figures. No surprise that Mummelsee is a favourite destination, and quite a bit touristry on weekends. Walk around the lake, discover the lake in a pedalo, or relax on the hotel terrace with local food and drinks. Another glacial lake along the route is the Wildsee. Surrounded by rock face up to 120m of height, Wildsee really has a picturesque location. Take the chair lift to the top of Ruhestein. After a 2km walk you reach the Wildsee lookout. A steep walk takes you down to the lake. 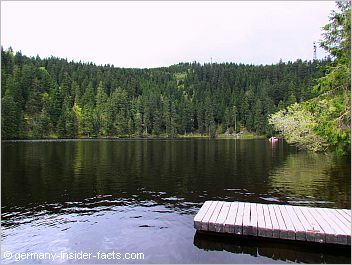 These circuit lakes (Karsee) are often called "the dark eyes of the black forest". Kniebis is the only small village on the Schwarzwaldhochstraße, still at an elevation of 960m. From here the road goes downhill to its final destination Freudenstadt in the northern part of the central black forest. The Schwarzwald-Bäderstraße (black forest spa route) takes you on a 270 km circuit through lovely valleys, to historic villages, monasteries and elegant spas. Pforzheim (population 120,000) is the northern entrance to the black forest and well-known as Germany's gold and jewellery city. Schmuckwelten is an unique interactive experience and shopping centre. Discover everything about watches and jewellery in this 4000m² complex. Bad Wildbad (population 11,000) - This is not just another spa town in Germany. Bad Wildbad combines international flair and rural cosyness. The Palais Thermal, formerly known as Graf-Eberhard-Bad, was built in 1847. It is not a bath, it is a wellness palace in oriental style. It features the Moorish Hall, 12 thermal pools, sauna, roman steam bath and many more amenities. Another impressive building is the former König Karl Bad, today known as Haus des Gastes (house of the guest). The town hall is quite nice as well. The Sommerberg funicular railway takes you on top of Sommerberg with great views over Bad Wildbad and the black forest. There is a bike park, a playground and picnic areas. Sommerberg is famous for hiking and biking in summer and skiing in winter. There are two paragliding launch sites at an altitude of 700m. Located off the main road from Pforzheim to Freudenstadt, Bad Wildbad nestles in the Enz valley. Nevertheless, you can easily go there by train. The Enz Valley S-Bahn from Pforzheim stops right in the middle of the spa park. Enzklösterle (population 1200) - this small village in the Enz valley has a famous woodcarving exhibition. Krippena displays the world's largest Christmas crib. Baiersbronn (population 15,700) - the town Baiersbronn combines several villages in a most beautiful landscape. Relax in health resorts, get active with hiking, mountain-biking, winter sports. However, Baiersbronn's clame to fame is the density of Michelin star awarded restaurants in its vicinity. Are you curious? 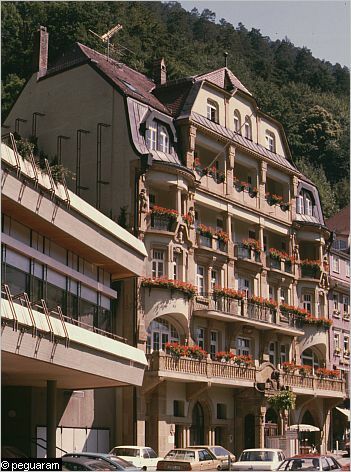 The awarded restaurants are the Schwarzwaldstube im Hotel Traube in Tonbach, Restaurant Bareiss im Hotel Bareiss in Mitteltal and Restaurant Schloßberg im Hotel Sackmann in Schwarzenberg. Do you wonder where to stay? Altensteig (population 11,000) is a picturesque town that nestles in the hills above the Nagold valley. Calw (population 23,000) is a major centre in the Nordschwarzwald. There are beautiful half-timbered houses in the old town around the market square. One of these houses is the birthplace of poet and novelist Hermann Hesse, who recieved the nobel prize for literatur. 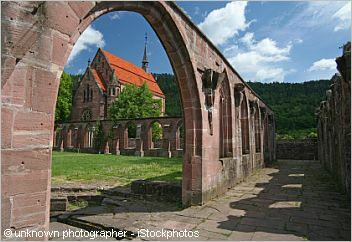 Hirsau (population 2200) - The town developed around a once very prominent medieval Benedictine Abbey. 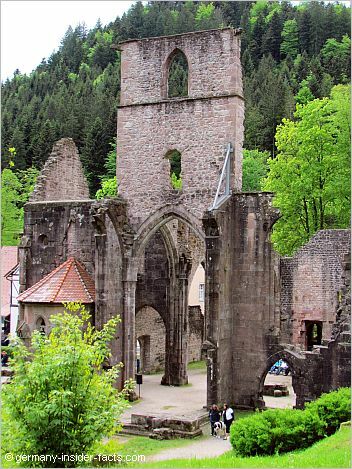 Remains of the cloister, Marienkapelle and Eulenturm can be visited. Above right is a map of the northern black forest to help you plan your trip to this most wonderful part of Germany.